Marrakech is certainly worth a stay of at least a night before and after a trek, preferably longer. Although there are Western-style hotels on the outskirts, we recommend you stay in a traditional riad (small hotel usually with an enclosed, central courtyard) near to the main square of Jemaa el Fna, in the heart of the medina. Trek Atlas recommends 4 traditional riads, Riad La Belle Epoque and Riad Linda and El Arsa and Riad Maroc. All are close to the main square, are typically Moroccan and offer excellent value for money. 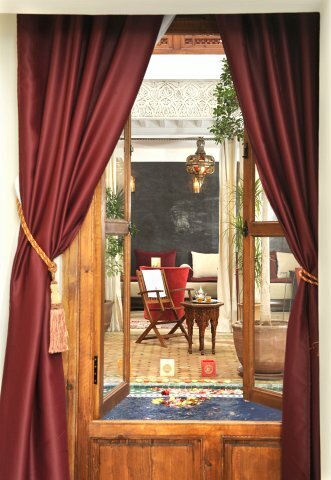 Riad La Belle Epoque is situated in the historic heart of Marrakech, a few minutes walk from the main square of Djmaa el Fna. 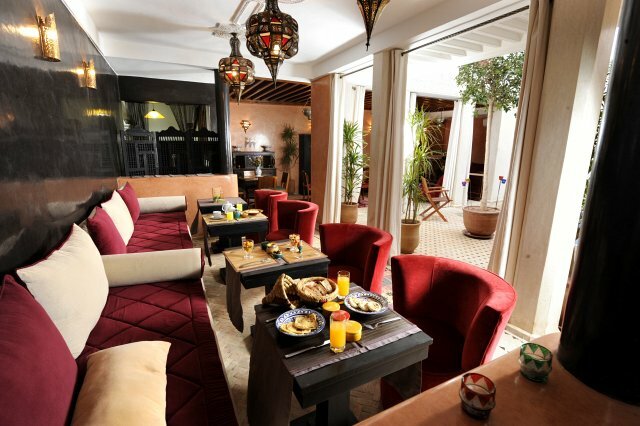 Run by a Spanish company , it is Moroccan staffed and has a distinctly Moroccan atmosphere and cuisine. 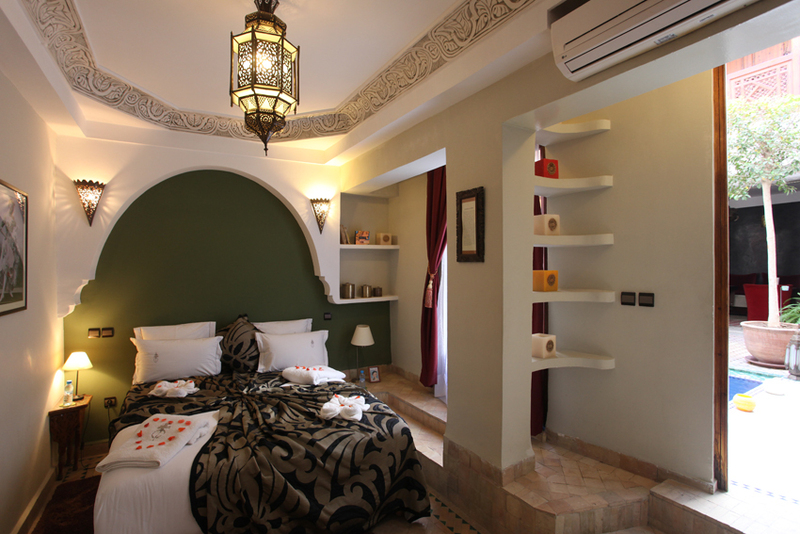 Riad La Belle Epoque has 7 spacious rooms. Each room is decorated with Art Deco furniture and objects combined with traditional Moroccan style and is dedicated to female characters from the 1920’s, such as Isadora Duncan, Coco Chanel and Josephine Baker. All rooms are equipped with free WIFI, air conditioning / heating and bathroom facilities. 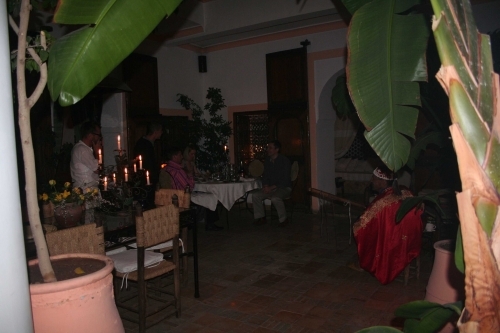 All the food – breakfast and the optional evening meal – is freshly prepared and typically Moroccan. The hotel has a roof terrace with sunloungers and on the ground floor, in the traditional courtyard, is a lounge area with plunge pool and for colder evenings a living area with fireplace where you can relax. 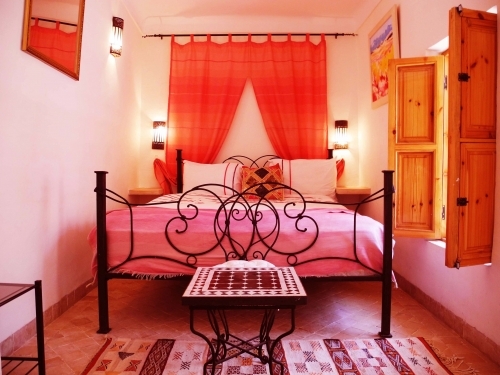 Riad Linda is a lovingly restored, beautiful old house, peacefully situated in a very welcoming neighbourhood in the heart of the Marrakech medina yet only five minutes walk from the souks and Jemaa el Fna Square. 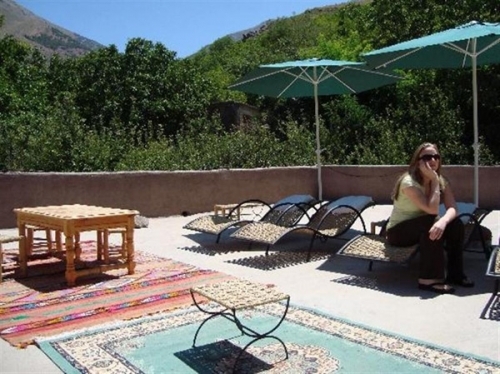 Riad Linda has a beautiful dining courtyard, bhou (salon) with fountain & a large, sunny, roof terrace ideal for breakfast, dining under the stars or relaxing on sun loungers. Our traditional Bedouin tent provides a lovely shaded area. From our terrace there are views towards the Koutoubia Mosque which looks even more spectacular when lit up in the evening. There are also views across the medina to one of the royal palaces, local mosques & the High Atlas Mountains. We have 6 bedrooms. All our bedrooms are twin / double rooms. We also have our lovely spacious Douria Suite on the first floor. Our beds all feature cotton sheets, duvets, & blankets for your comfort. 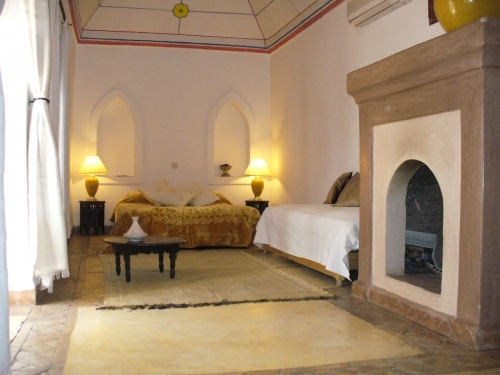 Our bedrooms are all en suite with large walk in showers & traditional tadalect walls. All towels & linen are supplied & there are hairdryers in all the rooms. Individual air conditioning / heating units are also in each room to ensure your comfort. Our helpful & friendly English and French speaking staff at the Riad will provide a warm welcome with mint tea. We have our own cook available to prepare wonderful home made Moroccan cuisine such as lemon chicken with olives, lamb tajine, vegetarian couscous. To book, check availability or for more information contact Riad Linda via Tripadvisor. 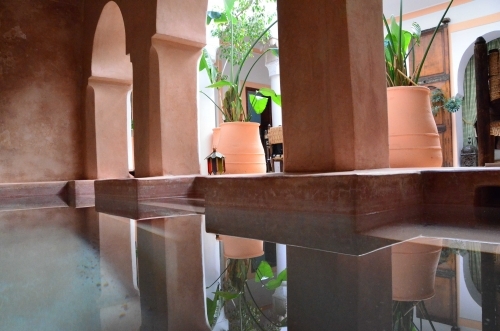 Villa El Arsa, a traditional well established riad, is perfectly located in the heart of the Medina of Marrakech, near the vibrant main square of ‘Place Jemaa El F’na’ with its snake charmers, story tellers and medicine men. With its simple rustic charm, Villa El Arsa is the ultimate retreat for those who are after a bit of peace and tranquillity in beautiful surroundings after the bustle of Marrakech. As you step through the wooden door, you will find Morocco’s inimitable allure reflected in this wonderful sanctuary, characterised by its well planted courtyard and refreshing pool. 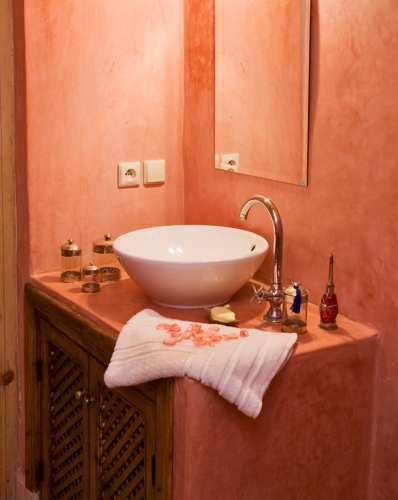 4 double/twin air-conditioned /heated bedrooms (one with an extra bed) all rendered in calm neutral tones with splendid ensuite bathrooms, ( either walk-in showers or deep bath tubs) both of which have been created out of traditional Moroccan ‘Tadalakt’. The bedrooms are ranged around the first floor gallery. Welcoming central courtyard set up with table and chairs. Small pool to one side. 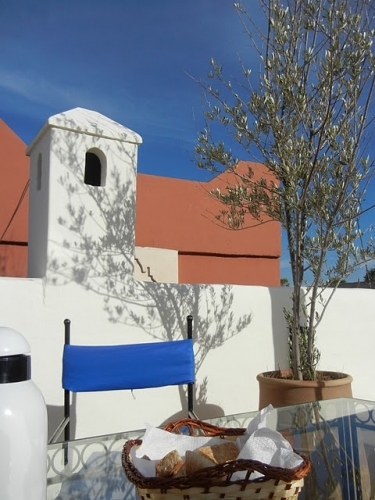 Roof top terrace with sun loungers, also with a shaded sitting area with fireplace for cooler evenings. To book, check availability or for more information contact Riad Villa El Arsa via Tripadvisor. Riad Maroc. 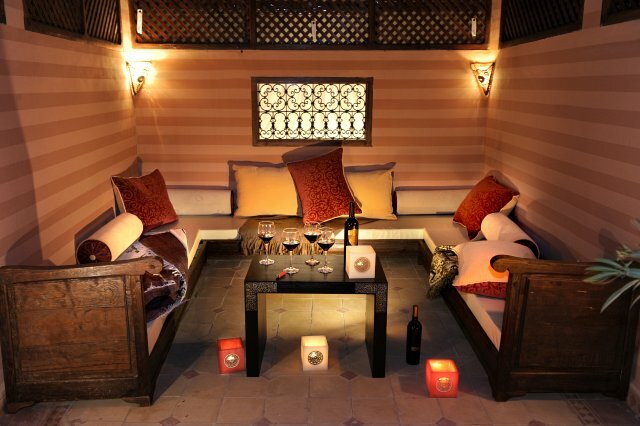 is a charming traditional Riad ,situated in good area of the Medina. at Dar Bacha,, close to the souks and a short distance from Gueilliez new town. 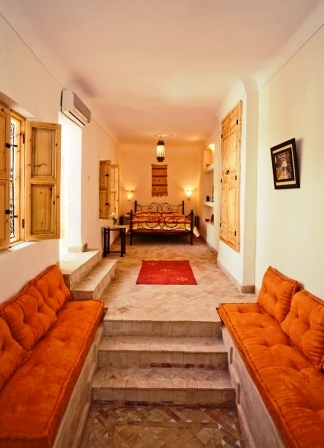 Riad Maroc is a well equipped self catering riad, with 4 bedrooms (sleeping up to 8) and 3 bathrooms . It is well set out over 2 floors with a salon and 2 bedrooms on each floor and a well planted roof terrace for al fresco relaxation and dining. It is ideal for exclusive rental but can be rented on a room only basis subject to availability. To book, check availability or for more information contact Riad Maroc via Tripadvisor.